These are the resolution sizes for various custom files in game. Please remember to save your textures in RGB color mode. CMYK will not work and will crash the game. To make sure your textures are looking their best and loading properly, try to use power of 2. If you encounter an issue with your texture not loading sometimes making a minor adjustment to the size will fix it. 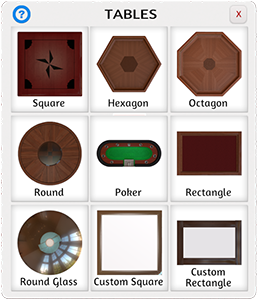 There are two custom tables where you can add an image to the tables to make them fit with your themes. There is no set size for this table as it’s a perfect square, but be sure to use an image that is the same on both sides (example 2000×2000), so your image doesn’t get distorted. The dimension for this table is 4400×2600. Custom Boards – The custom board adjusts to the size of the image you import, so there is no set size for this like the custom tables. Custom Backgrounds – 4000×2000 is recommended. 8000×4000 max. Any larger than this and you can risk crashing the game. 3D Models – Keep the vertices below 25k for best results as any higher they may not import and/or crash your game.